Orzo stuffed peppers get an Italian flavor boost with the addition of a Tuscan herb mix and parmesan cheese. Baby spinach ribbons and halved tomatoes add to the delicious flavor of the pasta stuffing. 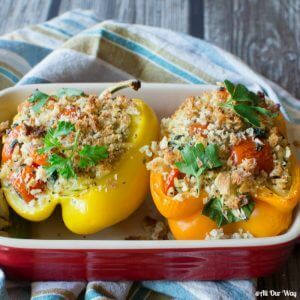 Garlicky bread crumbs top the stuffed peppers giving the dish a nice crunch. After unloading the car from the Saint Simons Island trip, we needed groceries, fresh vegetables and fruit to be specific. Our first stop was Lucky’s, our favorite vegetable market. When we walked through the doors, a huge pyramid of colored peppers greeted us. They were on sale! I just couldn’t pass them up. A red, orange and yellow pepper ended up in our cart. Don’t you just love a great sale? Is there one thing you just can’t pass up? At first, I’m not sure what I’m going to do with the colorful veggies, but stuffing them keeps popping up in my head. Red, orange, or yellow peppers are perfect for stuffing. The colored peppers, unlike the green, don’t taste bitter. If the stuffing is already cooked, you don’t have to cook the ingredients in the pepper. Why should that be a good deal? Well, it prevents the pepper from getting mushy. We like green peppers, don’t get me wrong. But since the green pepper is the unripe version of the red pepper, sometimes it tastes bitter. 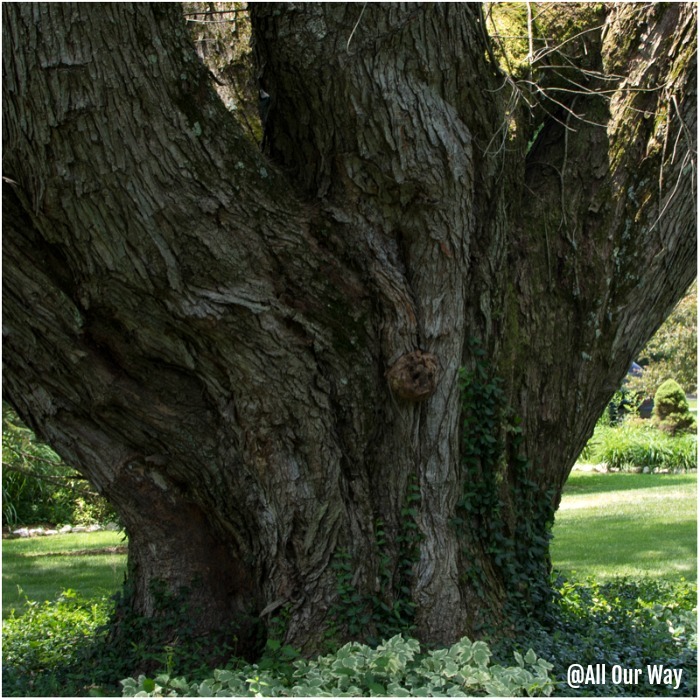 You’ve heard the saying “You play; you pay?” In May there were several storms in our area, now that we’re back, there’s yard work to do, like weeds to pull, and lots of sticks and limbs to pick up. In our yard, we have humongous trees that love to drop whatever they feel like dropping. Since we’re so busy in the yard, that leaves little time to make complicated dishes. Orzo, we decided, will be ideal as part of the filling. The small pasta combines well with other ingredients and it’s small enough to easily fill the pepper halves. The stuffed pepper flavor, we agreed, will have a tasty Italian zing. Adding some spinach and grape tomatoes increased the veggies in the dish. In order not to have a mushy pepper, I prepared the filling before going outside. Once I come back inside, I can bake the orzo stuffed peppers right before dinner. The yard clean-up took a few hours. I’m glad that the major preparation of the peppers was done. Being busy and eating well is compatible. My mamma always stressed it’s just a matter of preparing ahead. Once the oven preheated I placed the stuffed peppers in the oven. Now’s the time to relax, pour a glass of wine, and count our blessings. It’s great to get away but it’s wonderful to return home. It gives us an appreciation of what we have and lets us refocus on the importance of family and staying connected with them. What do you find is most important in your life? Dinner’s ready. A tossed salad, seared fresh tuna, comples the meal. Orzo Stuffed Peppers get their Italian flavor from the dried Italian herbs and the flat-leaf parsley. The peppers are packed with nutritious spinach and grape tomatoes along with the pasta. The recipe is low in fat and high in taste and satisfaction. 3/4 cup orzo rice-shaped pasta, cooked al dente according to directions. In a large pot, boil salted water for orzo; cook until al dente, following package instruction. Drain, reserving 1/2 cup of pasta water. Cook the 1 teaspoon of the minced garlic in the 2 teaspoons of olive oil over medium heat. Stir. Once the oil is fragrant but not brown add the spinach, grape tomatoes, parsley, Italian seasoning, salt, and pepper. Let cook for about 5 to 6 minutes until the spinach and grape tomatoes release their juice. Stir in the cooked orzo and add a little of the pasta water a little at a time so that the ingredients all mix together. Add the parmesan cheese and mix thoroughly. Add the remaining 1 teaspoon minced garlic to the melted butter. Pour the butter mixture of the panko crumbs and mix. Add freshly ground pepper. Arrange the pepper halves in an oil sprayed casserole dish. Fill the peppers with the orzo mixture - pile on!! Top with the garlicky breadcrumbs. Loosely cover top with foil and set in oven. Bake for 25 minutes. Remove foil the last 5 minutes of baking. Let rest a few minutes then serve. This can easily be doubled or tripled. Also whenever we make orzo it seems to be done in less time then the package directions says. Check to make sure you don't overcook. 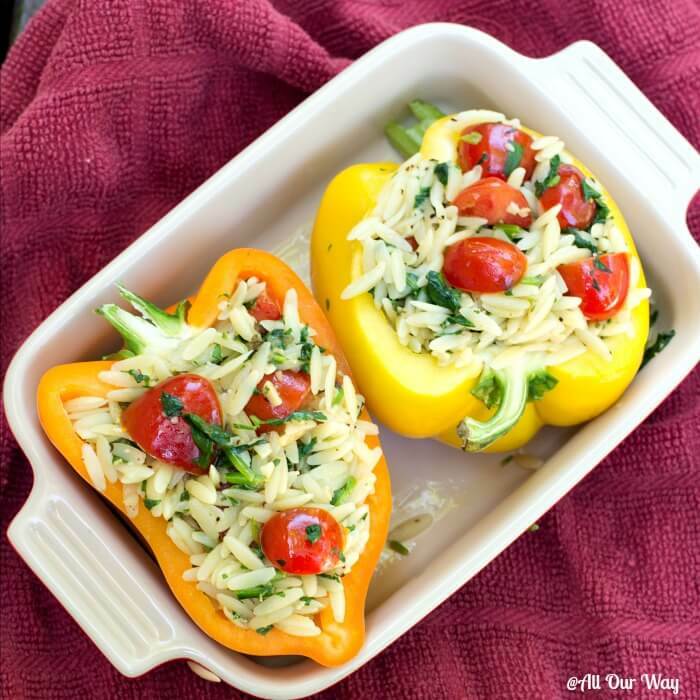 I love this stuffed peppers with orzo, I make usually with rice. I need to try with orzo I can get orange and yellow pepper now 98cents in grocery store. So I can make this. . You have big tree in backyard that is wonderful. I love stuffed peppers, but I’ve never thought to stuff them with orzo. I’d love to try these with all of their brilliant Italian flavors. Stuffed peppers are like the best thing in all cultures. My in-laws make stuffed peppers with rice. My mom made it with ground beef or shrimps. This Orzo sounds perfect too! I love how simple this is. I can imagine how much work there is in the garden with all those sticks and leaves falling this time of the year. I have always used escarole in mine like my mom but we do love spinach more ,, I am going to sub it next time and I love the idea of all those colored peppers what a pretty dish this made! thanks for all the new ideas! The stuffed peppers look so delicious and colorful. 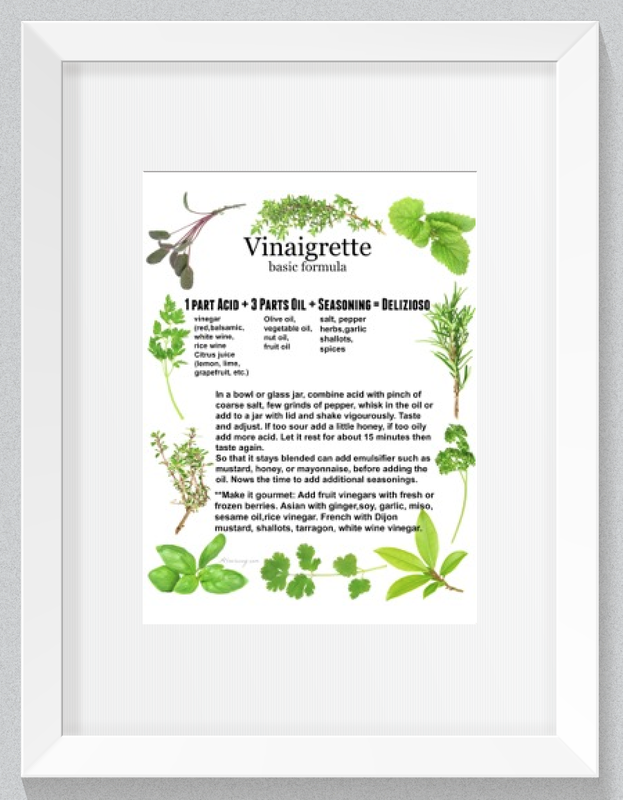 It will be perfect for a fun summer picnic or even a BBQ party at home. I’m going to try the recipe soon. They would be fun for a picnic, Molly. You could even eat them cold — the peppers keep their crunchy texture. Hope you give them a try. 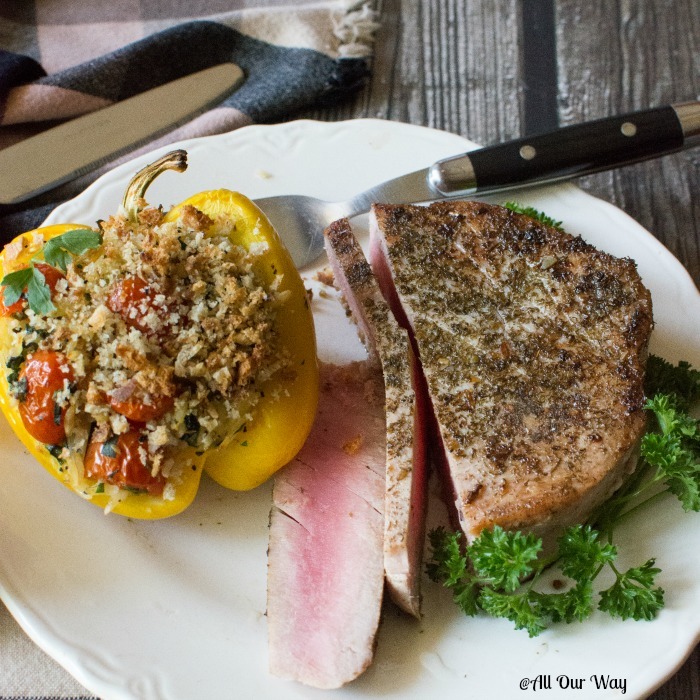 I always feel like stuffed pepper recipes are too meat heavy – so I’m in love with the orzo stuffing on this one! So beautiful and so light and fresh! We feel the same way, Mckenzie. The peppers are a great veggie side so they have just a bit of pasta stuffed in them. So good and light. Love stuffed peppers but I always do the meat and rice or barley thing. Clearly I need to try something new! Love this idea. Hi, Carol! You’ll really like the ease of the orzo and the plus is you can assemble them ahead of time and add your favorite ingredients to the orzo. 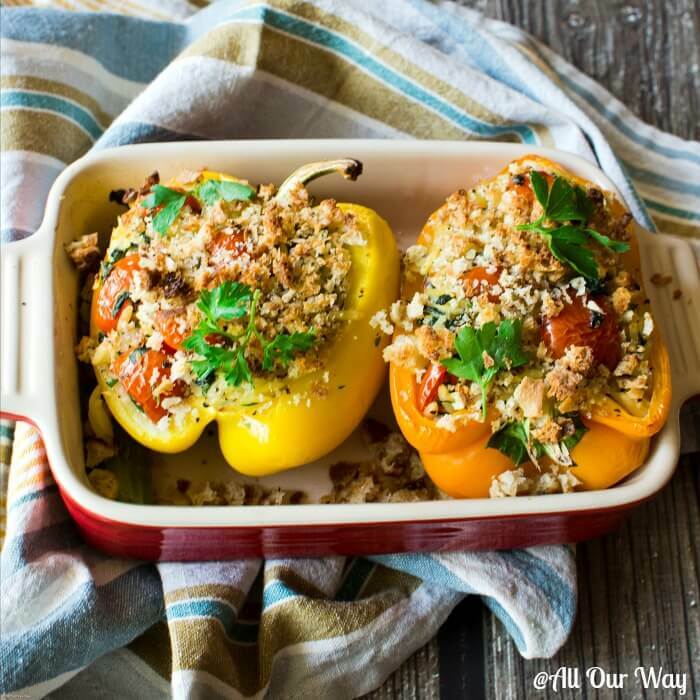 What a wonderful and beautiful version of stuffed peppers! I love how colorful this dish is, and never thought to use orzo in stuffed peppers. I would love this, and think it might be one I need to make for upcoming summer gatherings. Yum! Thank you, Marlynn! It would be great to make for a gathering. You can assemble ahead of time and bake before getting together. Have a great day!! That is one beautiful tree and one delicious sounding dinner. I wish I had these right now to pair with our steak tonight. Adding this to next weeks menu and can’t wait to try it! Hi, Jessica! The tree is huge!! I wish I could have gotten a total photo of it with the branches. The beauty of the peppers is you can prepare them early in the day and then make them just before you’re ready to eat. Hope you give them a try. It has been a long time since I made stuffed peppers. Now I have a craving to make them after I read this. Perfect for entertaining…and I LOVE having some leftover for an other delicious meal during the week. Off to the grocery store to buy some peppers. Well, Gloria, I’m a proponent for giving in to your cravings! ? You had me at peppers! I love peppers in all dishes! Stuffed and baked… m m m! 😀 Love the pics too! I never thought to stuff peppers with orzo, but I certainly will now. These look delicious. Your tree is enormous! 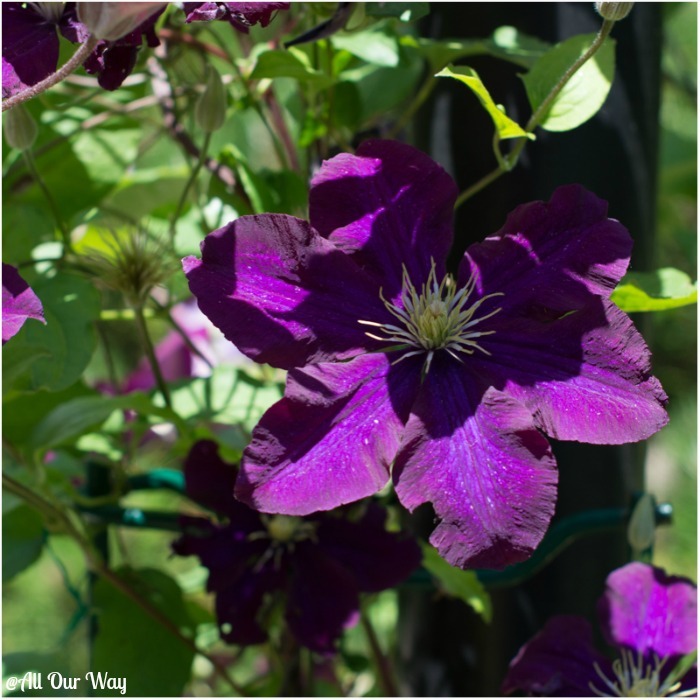 And I love that clematis too. Yes, vacations are wonderful, but there is always lots to do upon return. Thank you, Linda! Sometimes we like to stuff them with farro. Those cute veggies like to be stuffed with just about anything. Have a wonderful day!! Hope it’s sunshiney. Abbracci! I have a problem passing up the pretty peppers and usually bring home more than we can really eat. I’m always looking for new ways to serve them! This is going on the list. I can totally agree with you, Noel. When they’re on sale it’s just impossible not to put them in the cart. I need to get to the store and replenish my supply. ? Oh this sounds so wonderful and looks so colorful. I must admit I have never made orzo myself yet. I have stuffed small peppers with filings. My mother in law use to make a polish dish with rice stuffed in the peppers. Peppers are so versatile…I can’t wait to try this Marisa. Orzo is one of my favorite pastas and sweet peppers are the best. Great idea to use the pepper as the vessel to serve the salad. Hello, Adriana! I really like using the vegetable itself in serving. 🙂 Already thinking of the next stuffing we can make. Have a great weekend. Hi Marisa……Thanks, for another tasty side dish…..As always, the grill masters tuna is grilled to perfection? Happy Father’s Day to the grill master and my awesome brother???. Hi, Susie!! Love sharing recipes. As I recall you used to have some great desserts.? The Grill Master is getting an early start this weekend. He is making Asian style baby back ribs today — Jason will be here so we are starting the celebration early. Love to everyone. Tell your Hubby Happy Father’s Day!! ? We have red and yellow bell peppers growing now. Might have to get some sooner to enjoy this recipe! Sounds and looks delicious. Thanks for all your wonderful posts. I just made stuffed peppers last week for the first time, but they weren’t nearly as cute as yours! I will try yours and impress hubby… AND who knew about the green pepper?? Being unripe and all?? Soooo much for this southern gal to learn, so little time. 🙂 Thanks for welcoming me back, it’s good to be back, missed you too! Glad to have you back, Elizabeth, and Ellie too! Hope you have a great weekend and tell Hubby Happy Father’s Day. I’m sure Bear will make it special. 🙂 Hugs!! This is,a lovely dish! Colors so bright, Can’t wait to dig in and eat these! Another great post , Marisa! Thank you, amica! Do you have peppers growing in your garden?? Tell your Hubby Father’s Day! che bella presentazione Marisa, mi hai dato una buona idea ! Un abbraccio ! We are of like minds today – both stuffing peppers. you have a great filling with lots of delicious ingredients. Wonderful side dish.